“Wasted” is an upcoming Huntington Library event that costs nearly $100 for members. They’ll be showing the 2017 Rockefeller Foundation-sponsored food waste/ecoresponsibility documentary of the same name (featuring executive producer Anthony Bourdain, with Dan Barber of Blue Hill, Danny Bowien, Mario Batali and various other chefly friends, though none of those guys are slated to show up in person at the event). Plus local/LA top chefs demonstrating gourmet-ish fun things to do with the parts of vegetables and herbs we normally throw away. A lot of them seem to involve cocktails. I couldn’t quite put my finger on why that rang hollow, or at least kind of shallow. Much as I love the Huntington, I’m not going to be blowing a hundred bucks any day soon just to screen a Netflix doc from last year at a posh drinks event. I’m not a hipster, I’m barely capable of a glass of wine, so hard drinks are out, and my kid is heading off to college on the other coast in the fall, so I’m feeling poor-ish in anticipation. But I was kind of curious to see what was in the film. I went online and then to my local film-heavy libraries (this is the LA metro area) to see if I could screen Wasted in full for free. I tend to be crabby and skeptical of anything glib, or as Bourdain puts it, “smug.” But I was prepared to find something worthwhile in it–I enjoyed Kitchen Confidential when it came out. As much as I pick on him for gonzo style, I have liked various of Bourdain’s interviews and essays since for their attempt at consciousness-raising on life and food availability issues in other countries. The issues raised in the movie itself are pretty serious: America discards about 40 percent of its total food production, 160-plus billion dollars a year worth, into landfills (and generating a lot of methane gas through anaerobic breakdown, which apparently doesn’t occur if you compost properly). At the same time, nearly 1/7th of the people in this country have food insecurity–they go hungry. And the causes aren’t even buying a head of broccoli with best intentions and letting it sit in the vegetable bin for too long. They’re mostly issues of transportation cost, supermarket dumping past the sell-by dates, fear of lawsuits if the food’s donated instead, and imperfect-looking produce. It’s a national shame. Shots of poverty around the world, a claim, possibly justified, linking our waste of grain products in America and Europe to shortages in India and elsewhere, literally taking food out of their mouths. So far, picturesque and righteously thought-provoking. The film’s positive side also starts out promisingly enough: a Greek yogurt processing plant in Tennessee diverts the excess whey, which is full of sugars, to a fermentation vat where it produces methane gas in a closed-loop system. The methane generated powers the entire production line. Clever, frugal, reasonably clean energy, at least in this controlled context, keeps some of the waste out of the municipal wastewater, and it’s about Greek yogurt. Leftover and discarded sandwich bread–an awful lot of it, primarily end pieces from loaves used in sandwich-packaging factories–is being reclaimed and used creatively in the UK as the base grain for “Toast” ale and a similar beer (perhaps the same brand?) is now available in the US at Whole Foods stores (of course). We quickly sense a theme here. In fact, Wasted’s approach to a dirty and complicated topic is surprisingly clean-hands compared with most other films and books that address food waste and hunger. The live coverage and interviews are shot in-studio, in the restaurants, in the high-level, high-tech, high-ideals startups. A lot of footage is devoted to what great, cool and innovative things you can do for high-end, gourmet niche products if you’re creative with vegetable trimmings and give the less-familiar “garbage” fish a fancy Latin name and a place on your menu alongside the tuna steaks and branzino. To usher in the new year, we asked creative people to share the homemade recipes they count on to detox, cleanse — and refresh. Please. When you start describing breakfast in terms better suited to a moist towelette, and when the breakfast product itself comes out looking…well, let’s not even go there. I mean, check out the before and after food photos and tell me I’m wrong. The fashion-slash-yoga world tends to be convinced that cleanses and detox schemes are legitimate. Physiologists, internists and RDs with board certifications tend to disagree. Juicing, while obviously ultra-fashionable (still? boggles the mind), actually removes all the fiber, concentrates the sugars, and makes you wonder, given the thinness and the (frankly hideous) color of the stuff in the goblet in the right-hand “after” photo, whether it wouldn’t have been more genuinely nutritious, tastier, satisfying and visually appealing at the same time just to make some chunky vegetable soup–with garlic and herbs, not this sweet swill–and just wash and eat the apple with the peel. Because of course it would. Another article in the series shows the breakfast for a conceptual artist who includes “human bacteria” and Teva sandals in her exhibitions (why? and I mean, are you really tempted to follow her food conceits after reading that? )–a bowl with about 10 hazelnuts and a dusting of chia seeds, not exactly a meal, and on the side a shotglass of something that is admittedly a much better green than the first interviewee’s due to dark leafy greens rather than celery and carrots, but would still be better left unjuiced, lightly cooked in stirfry or soup form, and without any sweet stuff in it. And preferably with a hit of garlic. No major calories in this kind of breakfast, and perhaps we should be grateful that they don’t throw in any bacon or its variants with the veg, but really. Those breakfasts look pretty bleak and cold and less balanced than they ought to be, whether green or not-such-a-good-green. Why the “detox” label? Why the crash-style diet drinkies? Why an article series–not even just one ill-judged gush piece–on food that doesn’t really look or taste all that good or deliver that much actual nutrition as given in the recipes, and frankly isn’t necessary if you actually eat things like vegetable soup or broccoli and other greens as part of your regular meals? Is the NYT readership really that into these things? Are they in it for the post-holiday self-castigation value? None of the women interviewed (and of course they are all women, at least so far) are particularly unfit or overweight or heavily broken out or anything, and none of them look ill or hung over. Raises the question: just how badly did these people really eat during the holidays? You’d think from the tone of the articles that these artists had all been rolling around in crappy green and red sugar cookies of increasing staleness and chugging quarts of full-on eggnog all December just for something to do. It’s the only way the articles even begin to justify themselves. Mark Schatzker’s recent book, The Dorito Effect, is an energizing read for those of us who aren’t really into the classics of Superbowl Sunday. I’ll spare you the inside pages, but the closest to nutritious was Kroger’s own recipe for double-coated baked cauliflower “hot wings”–ingredients: a head of cauliflower, a little flour and water, garlic powder, Kroger’s store-brand hot sauce, and some melted butter to doll up the cauliflower florets before dipping in…ranch dressing. 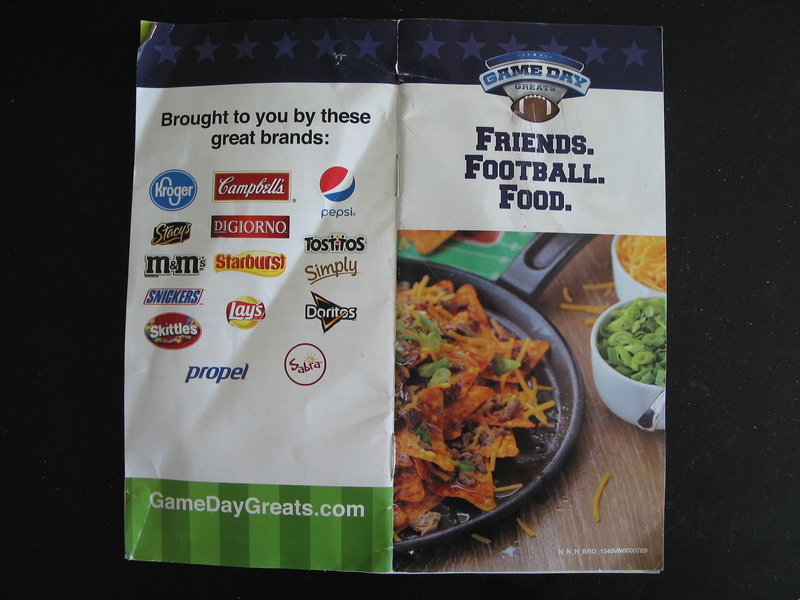 Not that it’s really so much about Doritos, but rather that it takes the 1960s invention of Doritos–a “taco-flavored” taco chip without any actual meat, cheese or salsa, just what has become known to all as orange cheez dust–as the first serious divorce between food and intrinsic flavor. It isn’t really the first, of course, and Schatzker traces the history of post-WWII mass agriculture as the story of more food, grown quicker, with less and less flavor. Everything from tomatoes to chickens to broccoli to wheat comes under the microscope lens here. Yes, it’s another Michael Pollan-style examination of some familiar complaints about how and why nothing tastes the same anymore. Schatzker tells a fairly entertaining version of this tale–how Big Food and Big Agro convened with flavor chemists to alter the course of human gastronomy in the wake of WWII. As we breed livestock and produce to grow more, bigger, faster, he discovers, we lose not only flavor but nutrients and replace them with water and carbohydrate filler even in things like broccoli and tomatoes. And then we try to make up for that by dousing them in ranch dressing and orange cheez dust and artificial flavorings; hence the title of his book. Coatings, dressings, artificial flavorings, salt, sugar and oils–these, he says, have become the substitute for intrinsic flavor in real foods, and a mainstay of the unsubstantial snack foods–starting with Doritos–that have pushed out bulk produce and unprocessed ingredients in the American diet. Schatzker takes it a couple of steps further, though, presenting his theory that the loss of flavor in real foods is the key factor to blame for American overconsumption of calories, and that flavor is one criterion we should work to restore at a national level. Yes, we’ve read much of this before elsewhere, but his interviews are still eye-opening. He interviews flavor chemists at McCormick, which does a lot more of its work behind the scenes of the restaurant and processed food world than you might think. Those little bottles of herbs and spices on supermarket shelves are just the tip of the iceberg. I want to give a quick thanks to Dr. Marion Nestle, who took the time to let her readers and colleagues know about Sunday’s Dietary Guidelines post in her Twitter feed and on her blog, foodpolitics.com, which I’ve read with interest ever since starting this blog. The response has been overwhelmingly positive and I appreciate it very much. Some things that rarely make it into US newspapers are considered more serious in Europe. Large-scale destruction of food, crops, livestock or arable land is one of the topics that really sets the French off, no matter what their political leanings. It’s an offense they’ve considered beyond the pale ever since Henry V invaded Normandy and Aquitaine in the 1400s. His officers and gentlemen destroyed crops and livestock wherever they went, siege or no, to the point that even their Burgundian allies wouldn’t forgive or forget. The French newspaper reports that Russia’s agricultural agency has stopped merely confiscating and returning embargoed out-of-country produce to its country of origin and as of today is now destroying it outright within Russia, either at the borders with Belarus and Ukraine, or seizing it from store shelves. Tons of tomatoes, nectarines, peaches, and other produce, meats and cheeses from Poland and western European countries that have participated in sanctions against Russia are being crushed and dug under with farm equipment or else incinerated at a plant near St. Petersburg. Given the likely hardship and isolation the Russian populace has experienced since Putin embarked on reseizing chunks of Ukrainian territory without admitting to it, you might think the best thing to do as a deterrent would be to seize the contraband and redistribute it evenly to the poorer citizens, and deny profits to the smuggler-importers. Grinding all that European-produced food under with tractors and the like may be a satisfying symbolic response for Putin, but it’s horribly wasteful and, as with the whole Ukraine project, not a benefit to the citizens at large. According to the article, the head of the Russian agriculture service admitted that destroying all that food doesn’t look good on TV. The country’s public media, including Tass, are portraying it pretty negatively. He hinted that the contraband is suspect in quality as well as in political origin–some of the cargoes had been deceptively labeled as coming from Turkey or the like, but had really been produced in places like Ireland. From what I can gather, the reporter at Le Figaro wasn’t too impressed with that argument, and it’s possible that the head of the agriculture service wasn’t too happy about being ordered to destroy the food either but couldn’t say so. And from the frequency of individual foodstuff mentions in the article, I’d say the waste of tons of peaches, nectarines, tomatoes and carrots and meat might be the greater part of the injury, but to the French, the destruction of all that fromage under tractor wheels was the final insult. The only thing I can think is, it’s a damn good thing it’s still summer, because if the government did that in the winter, or close to winter, the public reaction might quickly become something other than merely unhappy. It’s nearly June, the big northeast snowfest that lasted into April is pretty much over, and all the May and June issues of the big food magazines are showing…almost no fresh vegetables on the covers. Or inside. Oh, you do see some green–but it’s garnish. Flat-leaf parsley, a little cilantro, a sprig of basil maybe, chopped or torn over the cover dish to make it pretty. But very few actual vegetables–take a little walk with me down the newsstand for a sec. All magazine cover thumbnails shown have been lifted shamelessly–they’re not mine, they’re the property of their respective publishers–and pasted together here solely for parody value and critical review of the food literature. Saveur? Fried chicken. Seriously. Cooking Light? Hotdog special–one with a slice of pickle and tomato, another with avocado, to represent Vietnamese and Mexican, respectively. Whoo-don’t you feel like a world traveler now. Food and Wine? Burgers by Bobby Flay. Bon Appétit? Another burger. Food Network? They don’t even pretend. Ice cream cone. With whipped cream and a cherry on top. On a cone. The women’s mags are leaning toward desserts: Martha Stewart–cake. Southern Living, Allrecipes–pie. Better Homes & Gardens and BHG Diabetic Living both feature watermelon and ice cream or sorbet assortments. All of it very pink. 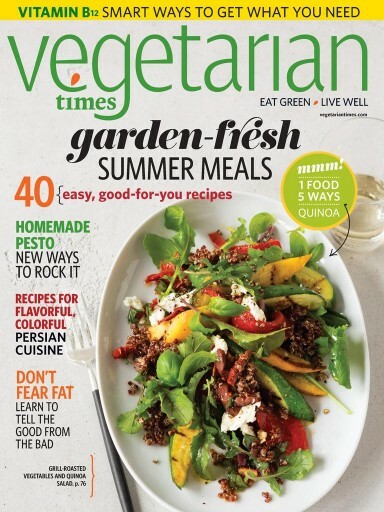 But even EatingWell and Vegetarian Times aren’t doing all that much vegetabalia on their green-looking covers. 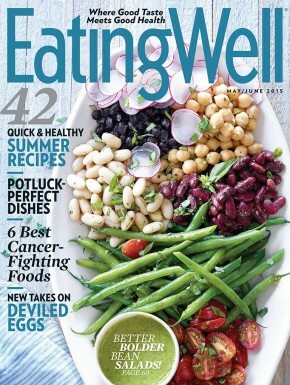 EW has a vegetable serving platter with a nice looking bunch of raw green beans and tomatoes at the bottom, but more than half of the platter is canned beans or dip. Not that I’m against those, but they really aren’t fresh veg. VT has a grilled veg and quinoa salad platter that looks wholesome enough, but if you zoom in for a closer look you realize it’s not mostly veg either. If you took a quarter of it for yourself, you’d only get 3 or 4 thin slices of pepper and zucchini on your plate along with the grain. Most of the green you see in the picture is a token sprinkling of arugula and basil sprigs strewn over the top–a strategy that’s being used and abused in the less veg-forward pubs to make steak or pork loin or mac ‘n’ cheese look like they have something fresh and healthy about them. Lucky Peach and Cook’s Illustrated both go for graphics rather than photos. LP has a cartoony poster graphic of garden lushness for “The Plant Issue”–do they really have vegetabalia inside? Cook’s Illustrated has a pastel of radishes. It’s as though they all decided to try to look summery without including actual bulk greens–the signature of summer (well, other than watermelon). I’ve complained about this before, I know, but back then I was talking about friends who don’t cook much and are somewhat veg-phobic, not about upscale food media. For years the food glam world has been touting local sourcing, farmers’ markets, heirloom this and that, Provençal and Spanish and Italian and Middle Eastern cuisines, which are full of vegetables one way and another. But they really are no longer practicing what they preach. They’ve shrunk their focus down to the meager American fast food paradigm while pretending otherwise. And charging you between 4 and 10 dollars an issue. But vegetables are so easy to ruin, you say. The green ones turn brownish olive if you hold them too long after cooking. If you’re going to hang around a whole hour waiting for the photographer to get the right shot, you’re going to have to cook a couple of batches in a row. Strewing a couple of sprigs of cilantro or parsley over something is so much easier! The other reason we’re not seeing vegetables on the magazine covers: editorial production lag. Monthly magazines typically take anything from 2-6 months to produce from start to finish, so they work ahead. The May and June issues probably went to press two months ago, when it had barely stopped snowing in the northeast (per my mother and sister). Summer vegetables are not bountiful in March and April under those conditions–at least not in New York and Boston. But the editors could have put together something decent and thematic for the covers if they wanted to–I’m pretty sure I could have sent them a likely looking CARE package from my local greengrocer’s if they’d only asked and were willing to foot the overnight shipping. Eat your heart out, foodie magazines! Time to gloat. 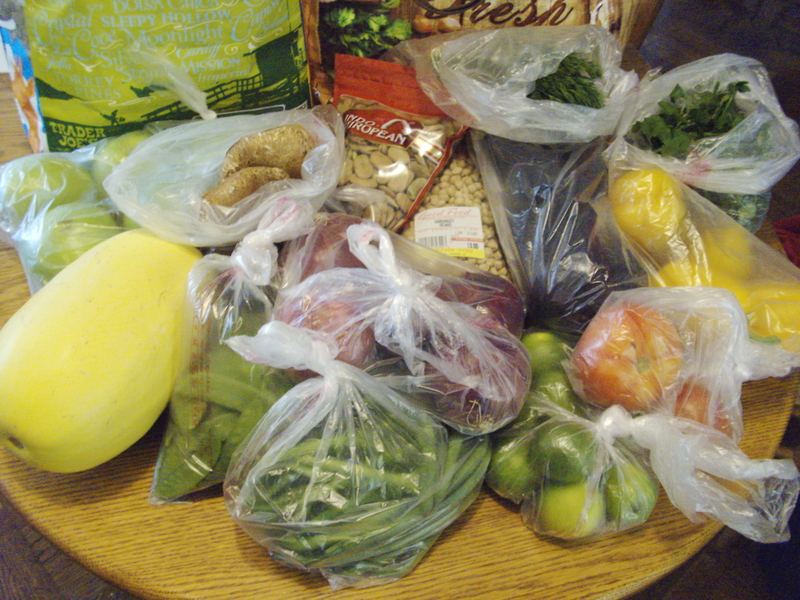 A typical weekly haul from my greengrocer comes in at under $30 even with a pound of coffee or tehina or yogurt (not shown, obviously), bagged spices, dried beans, and specials on fruit or nuts. When the tomatoes are better I stagger out the door with 5-10 lbs. at a time, but on the other hand the snow peas were a serious bargain this time around. All the food behavioral experts on both coasts seem to be whining that New York City’s new ban on oversized sodas “won’t work”. Well, all the experts in New York and LA. Even Michelle Obama has backed off delicately from taking a position on it. Oy. People! The Washington Post‘s columnists Ruth Marcus and Alexandra Petri have two different takes–one more serious but employing Yiddish to describe the psychology of the whole protest, the second, despite lack of Yiddish, funnier about people who insist on their right to drink a whole tubful of soda at a go. So I’m going to take the middle road–oh, screw it, I’m going to use Yiddish if I feel like it and still be hilarious despite my gravitas. Because it really is hilarious. If only it weren’t so sad. Jon Stewart is quoted as kvetching that Mayor Bloomberg’s proposed ban is the only thing that can make him agree with conservatives. David Just, partner expert to Brian Wansink, says people “want” their big drinks and will surely just find a way to work around the restrictions. Well, maybe a few will really want 20+ ounces of soda at a sitting badly enough to go back to the concession stands and wait in line three times to get 3 separate drinks of 8 ounces or so. Or juggle 3 small bottles back to wherever they’re drinking it all. But I’m betting most people won’t. Why do people supposedly “want” such huge drinks in the first place? The oversized Big Gulp-style cups were a marketing ploy that started about 15-20 years ago at the burger franchises and the 7-Elevens. They were supposed to look like a huge bargain–for an extra however many cents, they’d double the amount of soda they gave you. What a deal! And the ploy worked–created a habit. Most people don’t really need or even want that much soda, but as many of my coworkers–women especially–used to say, shrugging helplessly, “Well, I don’t really want this much, but this is the only size they sell.” And you really can’t split a 20-ounce with ice back at the office unless you have cups. Everyone will wonder whether you got tempted on the way back and started sipping from it. Eeeewww. You can’t save it in the fridge for later either because it goes flat pretty quickly. The soda companies got the concessions for school cafeterias–why not brand the captive audience early–in exchange for money the schools have lost from their cities and states anytime those governments wanted to hand out tax relief to corporations–like soda bottling plants. A different version of “eat local”. By now, people are so used to the soda bloat they’ve started to decide it’s their right to drink bigger than their stomachs–or bladders–can handle. And it is–you’re allowed to be stupid if you want to. Only problem is, did the soda companies also offer to build more bathrooms to handle the outflow? So I say Mayor Bloomberg, who’s in charge of the biggest city in America, is doing his city a huge favor by trying to get the soda industry’s claws back out of them. There’s no way the industry will scale back its sizes voluntarily, especially not if they can get experts like David Just to voice their incredible “the-consumer’s-the-one-who-wants-the-elephant-sized-drinks-we’re-just-providing-it-for-them” act. When you get the big gulp-style Coke, how much of it are you really tasting? Maybe the first third of it? Maybe less. After that, are you drinking it while reading your computer screen? Driving? Watching tv or a movie? Would you really want someone to film–and then post on YouTube–footage of you slurping mindlessly throughout the day? If you’re not paying attention to what you drink, is it worth drinking just because it’s there? Same for eating. And David Just and Brian Wansink–weren’t these the guys who did all that people-eat-30-percent-more-when-parked-in-front-of-a-tv-screen-than-at-the-table research? I do believe they were. So getting back to a small Coke that you’ll actually pay enough attention to to taste? That might be worthwhile. Then you can think about what you’re tasting and decide if it’s good enough to keep drinking. Or whether, like me, you’d rather wait until next Passover, when Coke and other big soda manufacturers put out limited editions made with cane sugar instead of corn syrup. I haven’t been a big soda drinker for years, and I usually don’t miss it at all. It was astoundingly easy to give up, and my teeth have thanked me ever since. On the rare occasion when I have a little at a party, my preferred soda is and always was definitely root beer or ginger ale, not cola, and usually I can only take about half a glass–it’s all way too sweet, even with ice. So I’m not the right person to sympathize with habitual soda drinkers–I just can’t get into it, and diet is gross. But having tasted the sugar version of both Coke and Pepsi, I can say the difference it makes to both versions is amazing–much cleaner flavor, and a little is enough to be happy with it. Meanwhile, a better idea would be to drink water instead of the big-3 flavors and save your shekels for small niche sodas with better, realer, more interesting flavors as an occasional treat. Case in point: a summer soda tasting event in Los Angeles to raise money to reopen exhibitions from the shuttered Southwest Museum in Highland Park. The Southwest museum had wonderful Native American collections–kachinas, headdresses, Bakelite jewelry of the 1930s, photos, and much more. It was taken over by the Autry Museum a couple of years ago, but has remained dormant since then with a lot of its collections in storage and out of the public eye. I was fortunate enough to have taken my husband and daughter there about 10 years ago, before it closed. Galco’s Soda Pop Stop, an independent soda market run by curator John Nese in Highland Park, is hosting the soda tasting–his second–with something like 500 different small brands, including plenty of nostalgia brands (though no NeHi Grape–don’t know if they’re still around) and imports. According to a profile of Nese in The Quarterly Magazine, Galco’s motto is “Freedom of Choice”, with flavors like coffee, bananas, spruce, cucumber, mint julep, and many others–check out their huge soda list, which includes ingredients, prices and bottle sizes! Amazing. Maybe that’s the kind of freedom soda fans should be going for. Amazingly enough, most of these flavors don’t come in 20-ounce monstrosities, or even in plastic. If you’re in Los Angeles on July 22, check it out–tickets are only $12 in advance, $15 the day of the event, and you can get them at Galco’s on York Blvd. or through the Friends of the Southwest Museum web site.